Tripping through the World Wide Web late one recent night I went looking for digs in Galway City for Honey Badger and myself for the first weekend of May. The dear flights and the dreaded rented car were booked and paid for in full. The trip’s bookends were in place. Our first Friday night would be spent with members of Haverty clan outside Gort in the County Galway. (Thanks, Eamonn!) The last Friday is set with our good friends in Shannon at the brilliant Oak Wood Arms, not far from the airport for the too-early Saturday morning flight. Being mid-April, it was about time to figure out where we would be staying the rest of our time in the West of Ireland. Of course there would be a night or two with the family in Knock out in Mayo with a bit of time put aside for a visit to Ryan’s Pub in Kiltamagh to see the old friends from my Hoboken days of 20 years ago who relocated back home. So, anyways, I was looking for a Galway City hotel for the first weekend of May. Honey Badger’s birthday is Cinco de Mayo, that first Sunday. I was hoping for something special for the piper chick who was brave enough to marry me. Our usual spot is a big name inn at the foot of Quay Street with free parking and easy access to the city’s liveliest lane. The hotel’s website stated that the weekend rooms were going for close to 200 euros, a hundred euros a night more than we normally pay. We always enjoy the stay there but not at that price. 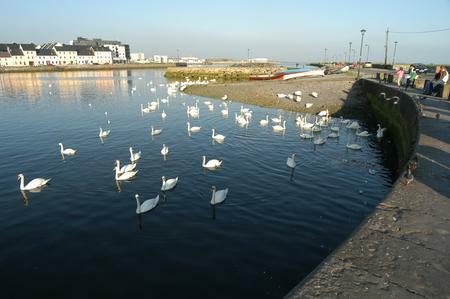 A quick search showed most other Galway City hotels were offering similar prices for the weekend. Fretting a bit, I messaged Eilís Nic An Rí. She’s the cousin in Galway. Maybe a B&B in Spiddal would work better for us. Did she know of any out her way? My note to her more or less asked if it was the start of a rip-off tourist season in Ireland. She wrote back it was a bank holiday weekend. Much to my chagrin, being a fecking eejit, I forgot that detail. It was akin to being a clueless tourist trying to book a Jersey Shore motel the Saturday night of Memorial weekend. The May Day bank holiday weekend is the start of summer in Ireland. My memory failed me on that fact. No worries. There is a plan B. Athenry is looking good that Saturday. Many a night here in North Jersey, the Polish piper, myself and Piper Irv have serenaded Honey Badger with the song that made that wee town famous and she has yet to see its fields. May is a fine time as any for the visit. And a full and proper Irish breakfast in the West is a brilliant way to begin any birthday and will carry us through a day of touring. We’ll find a spot for a proper celebration. Now we only need to start packing the bags for the next adventure on the roads and in small towns between Sligo and Kerry.